The event ‘Catalonia Nearby’ was a great success! In an attempt to provide more information about the Catalan situation, the referendum and the events leading up to it, the European Bureau for Small Languages (EBLT), Mercator European Research Centre and University of Groningen, department of Minorities & Multilingualism | Frysk organised a Frisian-Catalan evening at Tryater in Leeuwarden. At the event, experts from the Catalan region and from Fryslân discussed the current situation in Catalonia, and invited the audience to join the discussion. Catalonia and Fryslân: a spitting image? During the evening, it became clear that there are strong differences between the situation in Fryslân and Catalonia. Whilst Frisians share feelings of valuing their own culture and identity with the Catalans, they strongly differ in terms of economy and the number of speakers of the minority language. While Catalonia has a strong economy and has about 10 million speakers of Catalan, Fryslân doesn’t have this economic strength and numbers. Therefore, the circumstances in Catalonia provide an ideal breeding ground for pro-independence sentiment, while in Fryslân, such ideas are simply unfeasible. That passions run high in the Catalan situation, was demonstrated by Eva J. Daussà and Guillem Belmar, both from Catalan origin. Daussà, lecturer of linguistics at the University of Groningen, presented the historic, cultural and political context of the situation. 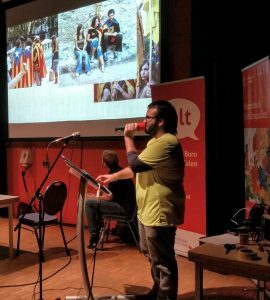 Student MA Multilingualism Guillem Belmar experienced the events in Catalonia first-hand, and spoke movingly about the emotional side of the referendum and the events leading up to it. Dr. Tilman Lanz, lecturer of anthropology at the University of Groningen and husband of Eva J. Daussà, reflected on the implications of the Catalan conflict for Europe. “The longer the European Union doesn’t mediate, the more violence becomes a risk”, he said. Frisian journalist Sybrand Grasdijk visited Barcelona and made a documentary about the events leading up to the referendum. During his visit he noticed that it was easier for him to identify himself with the young, pro-independence supporters than it was for his colleague, who was not brought up in a minority region. He posed that it is easier for youngsters from minority regions to understand the Catalans.